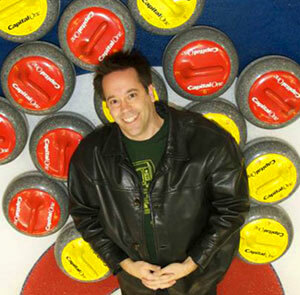 Greetings from The Curling Guy! Welcome to the wild, wacky and wonderful world of curling, the Olympic winter sport. The Roaring Game, so named for the loud rumble the 20-kilo (44-lb) stones make as they slide across the ice. What is it about this game of ice and stones, and brushes, and yelling? Many have waxed poetic about its lure, its surprising appeal to men and women, boys and girls, young and old, large or small, tall or short, celebrities or regular folk, skilled or klutzy. Those you see competing on television make up only 10 per cent – or less – of all worldwide curlers. Everybody else curls for fun and friendship, for fitness and recreation. Nearly all curling clubs – they're not in fact exclusive "clubs" – offer ice time for industrial leagues and private rentals. Got kids? "Little Rock" curling is for ages 5-12, using smaller stones, before Bantam and Junior age divisions. There are also school curling leagues, and even off-ice fun and educational programs where curling comes right into the school gymnasium. There is Mixed curling, featuring two males and two females on a team. There is Mixed Doubles curling, with one male and one female in a unique new discipline boasting its own world championship. There are vision-impaired leagues. Deaf leagues. Gay and lesbian leagues. Wheelchair curling is an official Paralympic sport. There are Intermediate curling competitions (over age 40). Senior curling leagues (50+) flourish during weekdays, as do Masters (60+) and Grand Masters (70+) leagues. Some people throw with a delivery stick, a device which extends a curling life to those with debilitating injuries or age concerns. These various "kinds" of curlers also mix and mingle, playing together in various leagues or "bonspiels", which are tournaments based on fun. Some bonspiels have raised millions of dollars for charity. Some of them bring superstar curlers, the ones you see on television, together with novice players. Curling is the sport for all. In the town of Stirling, in the country of Scotland, a man took a granite block, cut it, rounded it, and carved a date in it. 1511. The first known curling stone. Since that day, curling has been a game of the people. It has forgone trappings of commerce, embraced all comers. Cherish the truth that all who play the game on any rink, on any given day, can be victorious. Enjoy your time with The Curling Guy. Explore his history, his writings, ask a question. Read his weekly columns with Sun Media, learn about the Olympic impact. Consider him for your next event, for some personal instruction, or for your next corporate outing. And remember… you can’t knock curling until you’ve tried it. Plain and simple. Copyright © 2018 The Curling Guy. All rights reserved.